Property 14: SUPERB LUXURY STUDIO IN ASSOS-Stunning bay views -2 min to beach & tavernas! Property 20: Delightful Holiday Cottage Finished To A Very High Standard. Property 22: Stay at our peaceful, family run beachside studios enjoying fabulous sunsets! Villa with sea views. Upper apartment, sleeps four. Property 43: Villa with sea views. Upper apartment, sleeps four. Beautifully presented private villa in beachside location, Astrakeri Beach. Property 46: Beautifully presented private villa in beachside location, Astrakeri Beach. Authentic and genuine Corfu Villa Home Away From Home...... 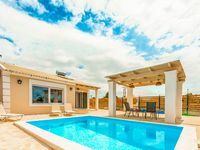 This genuine and well cared Greek home has all the warmth, character and charm you would expect from a vacation home.This home has everything you need for an authentic Corfu experience. The outside areas are perfect for soaking up the sun, with perfect sun and shade areas plus gorgeous outdoor dining. Just down the hill is the most friendly Supermarket, restaurants and Beach that you and family can walk too. A perfect home from home. We have already booked next year. We had an unforgettable stay at Villa Elia in Nisaki Corfu. The tranquility of the place was perfect. The view of the sea was obviously amazing. The pool, the size of the Villa, etc. We really felt at home. In short, we have no negatives and YES we would go back. Thank you very much and I hope ... see you next time.